This is the first installment of something that I've had in mind to do for a few years now. I think this is going to be a fun new feature of The Knight Shift. Here's the deal: my DVR is loaded... and I mean loaded... with movies that for some reason or another I've never watched before in my entire life. They've just been sitting there, waiting for me to take the time to partake of them. And as time goes by and especially as I find my knowledge of films has some significant gaps in it, I increasingly find myself wondering "what the heck's in there?" So I'm finally going to see what these movies are about, and then share my thoughts about them here on this blog. This is going to be an ongoing if irregular feature, but I'll try to do it at least once a month (the next few movies have already been selected.). I had to watch this three times before I felt confident enough to write about it and even now, I'm wondering if I "get" it on a level comparable to that of others. Now, I did enjoy The Big Lebowski. It's a Coen Brothers film, with all of the quirkiness that I've come to expect of them. No, more than that: it's their signature style all cranked up on high-octane crystal meth, and it makes for a hella fun ride. But my biggest problem with The Big Lebowski is that there is not one character - other than Donny and The Stranger - who I felt any measure of sympathy or empathy for. Take Jeff "The Dude" Lebowski (Jeff Bridges) f'rinstance. The central character to this mad tale of mistaken identity, bowling, and absconding trophy wives. I liked The Dude. He is, as The Stranger puts it, a man for his time and place. But I didn't particularly feel moved by him. He's someone to watch, not to be become attached to. Like a lab rat running around trying to navigate a maze... or doing its damndest to not be devoured by a rattlesnake. That, to me, is The Dude: a slacker out of his league (though certainly not by his own free will) who finds himself a pawn in a larger game. But that is all that he is to me: a pawn in a larger game. Although just as in chess, the pawn that reaches the final row can become a greater piece... and that is what The Dude is in the end. That's all that we know of him after that, what The Stranger tells us. I like to think that The Dude finally grows up and becomes more than the person we've spent two hours watching in this mad manic adventure. And then there is Walter (John Goodman). Again, no real attachment to this character. In some ways he's more pathetic than The Dude. Stuck in the past, unable to move beyond his failed marriage. Still trapped by his ex-wife. Using his unresolved anger about the Vietnam War as a cover (barely) for his frustrations. Am I supposed to feel anything for Walter? I lost any possible sympathy for him when he whipped his piece out at the bowling alley and threatened poor Smokey. And he was already blowing whatever goodwill he may have had with his torrent of F-bombs at Donny (Steve Buscemi). Like I said, these aren't characters that I particularly "liked". With two exceptions. One of them is Donny, who is suffering all of this nonsense with an extreme amount of grace. Donny seems to be the only one of this trio of bowling buddies who I had any sense of appreciation toward. Which makes what happens to him later so tragic, even heartbreaking. And then there's The Stranger (Sam Elliott, wonderful as always). The character who I found myself relating to the most. In large part it's because of his aversion to the harsh language throughout this movie (and in all sincerity, there is too much of it). But even that is an aspect of a larger dimension to The Stranger. He's the cypher, the framing device that puts the glorious mess of The Big Lebowski into proper perspective. The Stranger is the keystone of the entire enterprise. Without him as the bookends of this film, there is not much more than a barely-coherent mess populated by this Greek chorus of colorful if not likable characters. This is not an enviable set of circumstances at all, from start to finish. I mean, The Dude gets his head plunged into a toilet, fercryinoutloud. And then his quest to replace his rug (it really tied the room together) runs afoul of hostage situations, drugged-up visions and ninja-esque nihilists. Again, all involving more characters that I didn't have any sense of empathy toward. Maybe that's part of the point of this movie. It's to be witnessed, not to have any feelings of associating with. It's to be enjoyed, not to necessarily be understood and much less embraced. It's kinda like a comedy out of the Sixties. Yes, this is the Coen Brothers paying homage to Blake Edwards, as only they can. All of that said, I did enjoy The Big Lebowski. A lot. It is a Coen Brothers movie, and true to their style it's a work which is greater than the sum of its parts. Taken apart and divvied-up, there is not much to really enjoy. But mash all of those characters and situations together, and it's well-orchestrated hilarity flying past the retina in connected episodes of mayhem and Chandler-esque mystery. 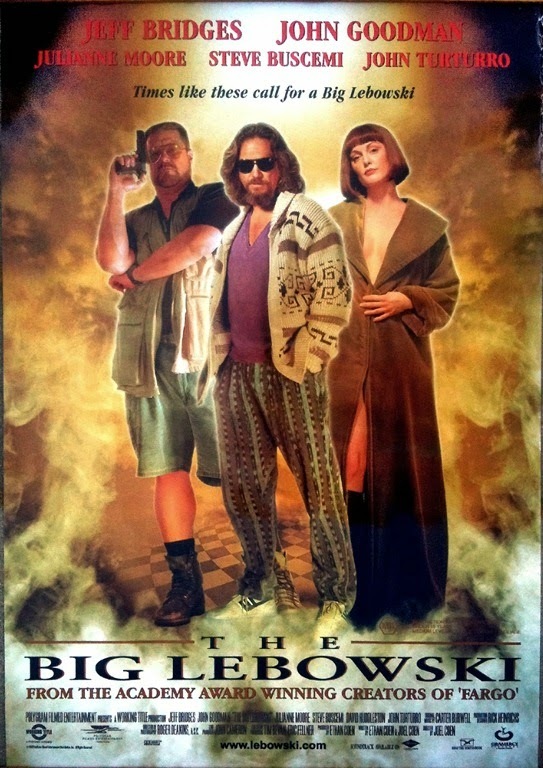 So, I finally watched The Big Lebowski, and I find my knowledge of movies all the more enlightened for it. I'm wondering if it's too early to put this film on the National Film Registry, as happened recently. But maybe with more viewings I'll come to understand and appreciate that more. And I do plan to watch it a few more times, at least. The Dude abides! Go buy yourself a new rug, make yourself a White Russian, and sit back and watch it again. Definitely the most quirky Coen Bros film they have made. Not sure if it truly is a "great" film, but it surely is a must - see film.